After hours of exciting adventure, Playworks Café is a great place to refuel. Playworks Café has a variety of food options—from classic favorites to healthy snacks. The kids menu will keep your kids happy with classic favorites like chicken nuggets, Kraft Mac & Cheese™, and more, while the rest of the menu features delicious options like pizza, wraps, fresh fruit, and appetizers. 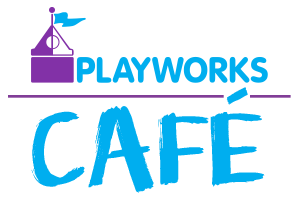 Interested in stopping by Playworks Café during Playtime or a Birthday Party? Check out the menu below! Crispy tenders with your choice of barbecue, buffalo, or ranch dressing on the side. Served with jalapeno cheese dipping sauce. Boneless chicken wings tossed in your choice of barbecue, buffalo, or dry rub seasoning. Crispy potato skins loaded with cheese, bacon, and green onions, served with a side of seasoned sour cream. Cheese, chipotle black beans, green onions, pico de gallo, and your choice of seasoned ground beef, chicken, or shredded pork. Served with salsa and sour cream. Served with a freshly baked breadstick. Grilled chicken, lettuce, black bean salsa, chimichurri dressing, and tortilla crisps. Marinated grilled chicken, romaine, Parmesan cheese, tomatoes, and croutons, tossed with Caesar dressing. Made fresh daily, and served with oyster crackers. A Minnesota favorite! Served with oyster crackers. Fry bread, seasoned ground beef, lettuce, cheese, tomatoes, black olives, and green onions. Served with salsa and sour cream. Or try it as a Taco Salad! Served in a crisp tortilla shell. Served with your choice of French fries, tater tots, or kettle chips. Substitute a fresh garden salad for $1.50. Slow-roasted shredded pork loin with barbecue sauce, topped with pepper jack cheese and crispy onions. Crispy chicken, romaine, cheese, tomatoes, bacon bits, and ranch dressing. Toasted Vienna bread with six slices of crispy bacon, lettuce, tomatoes, roasted garlic mayonnaise, and a side of pickle chips. Egg, American cheese, and your choice of bacon or sausage patties. American and cheddar cheeses on toasted Vienna bread. Add ham, turkey, or bacon for $2.00. Grilled to order and served on a sourdough Kaiser Roll with lettuce, tomatoes, red onions, and pickle chips. Crispy chicken, buffalo sauce, lettuce, tomatoes, and blue cheese dressing. Ham, turkey, bacon, lettuce, tomatoes, cheddar cheese, and mayonnaise. Marinated grilled chicken, romaine, Parmesan cheese, and tomatoes, tossed with Caesar dressing. Seasoned ground beef, mixed cheeses, tomatoes, black olives, jalapenos, and green onions. A celebration of meat! Pepperoni, sausage, bacon, hamburger, and Canadian bacon. Peppers, tomatoes, black olives, green olives, mushrooms, and onions. Sausage, pepperoni, onions, peppers, and olives. Served with your choice of French fries, tater tots, kettle chips, applesauce, or fresh fruit. *No side choice with salad. A dozen bite-size donuts tossed with cinnamon and sugar. Vanilla ice cream topped with chocolate syrup, whipped cream, and a cherry on top. Root beer, orange soda, or cola with vanilla ice cream. A crispy cone filled with a scoop of vanilla or chocolate ice cream.